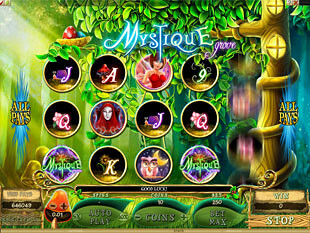 Mystique Grove slot machine can bring you into the fabulous world of gambling. Here you will explore a wonderful wood full of pretty elves, owls and other enigmatic habitants. Being a brainchild of Microgaming, this slots will present you with moments of unforgettable playing. 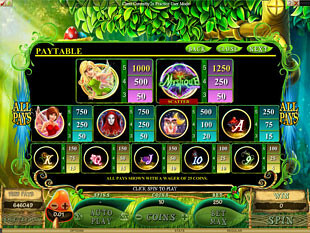 Representing a 5 reel video slot, Mystique Grove gives you more chances to make your pockets full with 1024 Ways to Win. No download format of the game may simplify your playing. As you need just to sign in and launch an instant game. And then you can become utterly engrossed in gambling. Wild symbol in Mystique Grove slot machine has the appearance of a Nest with fantastic eggs. This symbol can replace any other game symbols apart from the Scatter symbol. If you are lucky to substitute several Wilds in a win, the game will award you with the highest win. Mystique Grove Logo is the Scatter symbol. It has really great power in the slots. Thanks to it you are entitled to catch a Mystique Grove Bonus. Hit 3+ Scatters at one go and get a wonderful opportunity to enjoy the special Bonus game. Gain more and more coins and add them to your current playing sum. Moreover, the game is ready to make your day happier offering you the incredible Scatter prize. So take the advantage to obtain $312,500 just for 5 Mystique Grove Logos. The only task is to fix the maximum bet of $250. And you are the lucky owner of the real fortune. You are free to choose among the various coin sizes. They can be $0.01, $0.05, $0.10, $0.20, $0.25, $0.50 and $1.00. You can also select the amount of coins per line. Your choice can start with 1 coin. However the limit is 10 ones. Concerning the bet sum we can tell that it depends on the coins value and varies with it. The minimum bet you are able to put is $0.25. Whereas the maximum one represents $250. So it’s up to you to decide how much money to put at stake to win this or that desired sum. If you make up your mind to play with the highest bet, you have all the chances to grasp the highest magical jackpot. It counts 1,000 coins or $10,000 for 5 Blonde Fairs. Imagine! Just a few minutes of playing and you are wealthy! 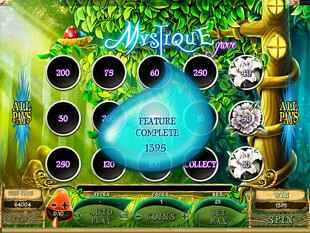 Mystique Grove is glad to offer you its great Bonus Game. Activate it with help of 3 or more Mystique Grove Logos scattered at the reels while spinning. Fulfilled this condition? Then you will see 15 magical flowers which you need to reveal. The more flowers you open, the more money you get. In case you happen to get a flower with a Collect sign, the feature finishes. 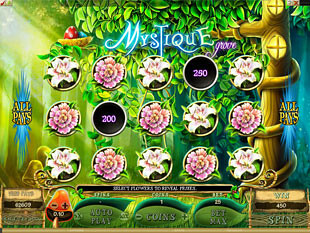 Mystique Grove slot machine will surely brighten your day. As it owns a delicate design. Picturesque images. Natural delightful sounds… It’s so pleasing to the eye that after playing it just once, you’ll fall in love with it and would like to keep playing all day long. The possibility of winning $312,500 makes this slots really fantastic. Who can resist temptation and gain such a good money while playing?